Successfully Added Hesvit G1 Bluetooth Smart Bracelet - Pedometer, Heart Rate, Skin Temperature, Sleep Monitor, Calories Burned to your Shopping Cart. The Hesvit G1 is a Bluetooth smart bracelet that can be conveniently paired with your smartphone through Bluetooth 4.0. It can be used with both iOs and Android phones, guaranteeing that it is compatible with the majority of smartphones out there. When synchronized, it lets you take advantage of a wide-range of fitness features. Additionally, it also notifies you whenever you are receiving an incoming call. Thanks to this, you’ll never miss out on a message from your friends, family, or colleagues again. 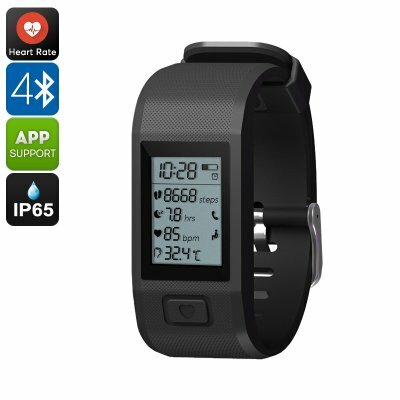 The fitness tracker features an IP65 waterproof design that lets you use it in any weather condition. By supporting a pedometer, this fitness tracker bracelet allows you to keep accurate track of your daily exercise levels. You’ll be able to analyze the number of steps you take throughout the day and the distance you have covered. Additionally, it will also show you how many calories you have burned. Your Bluetooth watch furthermore comes with a heart rate monitor and wrist temperature monitor. All these health features will provide you with valuable data on which you’ll be able to adjust your future workouts in order to optimize your results. Your Bluetooth sports watch comes packed with a 60mAh battery. When fully charged, this cell brings along up to 7 days of usage time. The smart bracelet itself has been crafted out of medical-grade liquid silicone. Therefore, it is safe to use and comfortable to wear. Thanks to its straightforward and sleek design, you can wear this fitness gadget with any of your outfits. No matter your future health and fitness goals, the Hesvit G1 Bluetooth watch will lead you there in no time. The Hesvit G1 Bluetooth Watch comes with a 12 months warranty, brought to you by the leader in electronic devices as well as wholesale sports watches..